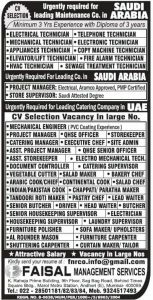 Job Opportunities in Saudi Arabia: SAUDI ARABIA FREE RECRUITMENT CLIENT INTERVIEW IN INDIA IN this month 2017 VACANCIES IN LARGE NUMBERS SPOT SELECTION DEPARTURE WITHIN 30 DAYS ECNR PASSPORT ONLY AGE LIMIT 40 YEARS. INTERVIEW VENUE From 8.30 Am to 5.00 Pm Only TCT Office Apeejay House. Apeejay Business Centre, No, 3 Dinshaw Vachha Road, D-KC College, Mumbai 20+CROSS COUNTRY PIPELINE MANAGERS 02 NOS PIPELINE ENGINEERS 02 NOS CROSS COUNTRY PIPELINE SURVEYORS 02 NOS BUILDING QUANTITY SURVEYORS 04 NOS LAND SURVEYORS 03 NOS CIVIL MANAGERS 03 NOS +CIVIL SITE ENGINEERS 04 NOS. Job vacancies are mentioned below. MATERIAL CONTROLLER 04 NOS MECHANICAL SITE ENGINEERS 04 NOS MECHANICAL SUPERVISORS 03 NOS +MECHANICAL FOREMAN 03 NOS +ELECTRICAL SUPERINTENDENTS 04 NOS *HEAVY EQUIPMENT SUPERVISORS 04 NOS (Earth Moving Equipment & Construction Equipment)CIVIL SUPERVISORS GCC Experience) 08 NOS CIVIL FOREMAN (GCC Experience 05 NOS + SAFETY OFFICERS INEBOSH/OSHAGCC) 10 NO.S WELDING SUPERINTENDENT 03 NOS.